I first saw what I am pretty sure was this beautiful buck during the 2010 archery season. It was in a meadow, with three other bucks about 200 yards from my tree stand. I was hunting on a small farm about 4 miles north of Geneva, NY. I had never seen such a big antler spread on a deer while hunting, and I never saw four bucks together while hunting. My lifelong hunting partner and nephew, Brad, and I have hunted this farm for well over a decade and have taken deer there in the archery, shotgun, and black powder seasons over the years. About four years ago, Brad saw a "monster" buck from his stand on the farm long before legal shooting hours. The last few years my oldest daughter, Marla, has been hunting deer with us, and this year, my daughter, Mia, also joined us for some hunts. We hunted the 2010 shotgun and black powder seasons without seeing a deer on that farm. The memory of that buck stayed with me until the 2011 archery season. I was very careful not to over hunt the farm and to be totally scent free. I only saw a couple deer during the 2011 archery season on that farm, with the best being a 7-point. That was pretty discouraging. I have had some success with mock scrapes over the years. For the 2011 whitetail seasons, I increased the number of scrapes that I either made or enhanced, adding a pre-orbital gland scent on their respective licking branches. Brad, the girls, and I hunted three days during the 2011 shotgun season without seeing a deer. We were getting very frustrated with no shot opportunities and also hearing lots of shooting on neighboring farms. However, I noticed a big increase in scrape use and new rubs during the first week of the shotgun season. On Saturday, November 26, Brad, Marla and I were planning to try the farm again. That morning, Marla chose to sleep in, so Brad and I got up early and were in the woods well before first light. I chose to use the tree stand in a pine grove that Marla usually sits in for that morning. I was disappointed that she didn't join us, and frustrated at not getting a shot at any deer on the farm for over a year. Friday evening Brad had noticed my frustration and said, "You have to be in the woods to shoot 'em". Saturday, the 26th of November, was a warmer than normal morning, with legal shooting to begin around 7:00 am. I was looking to my right at about 7:30 when I sensed that something was moving to my left. As I slowly turned, I saw that a buck had come from the meadow to the west and was traveling down a tractor lane towards one of the scrapes that was about 50 yards east of that stand. I did not know how big of a buck it was, only that it was a "good one". I stood up when he went behind a couple of trees to adjust my sling and position myself for a good shot. He stepped out behind a bush at about 55 yards and the first shot from my Browning hit him hard in the middle of his chest. He shuddered and tried to run, but couldn't get far as my next two shots left him dead about 30 yards from the stand. When he dropped is when I first noticed how big his antlers were. That's when I knew it was "him" - the huge buck I had seen only once over a full year ago in that meadow. His head was unable to touch the ground because of the size of his rack. Brad came over after climbing down from his stand and we both counted and recounted his 18 points including two almost identical drop tines. We were shocked at how big his antlers were! I wish Marla was in that stand that morning, she is a good shot and may have had the thrill of having him in her cross hairs. I feel very fortunate that that beautiful animal came close enough for me to have the opportunity to harvest him. 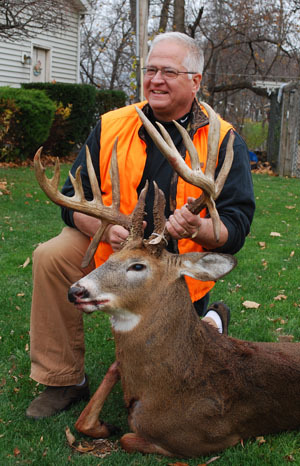 Mr. Robert Estes, an official scorer for the Boone and Crockett Club, and the New York State Big Buck Club, green scored this "buck of a lifetime" on December 8. It had a Non-Typical green score of 194-4 net and 203-2 gross. The main beams were 26", with an inside spread of 20-2". Several people said it was an older deer, and that it probably had a larger body weight and antlers a year or two ago. It weighed 158 pounds dressed at the deer processors. I am anxious to see it mounted. Hopefully I can get my wife to agree to put it over the fireplace. Mike's record book buck was officially scored after the required 60 day drying period at 210-6 Gross and 201-4 Net as a non typical.